While the mango season started with the Alphonso variety trading at Rs 18 a kg (model price), it jumped to Rs 30 a kg at the wholesale Vashi mandi. Mango prices are likely to remain firm this year because of lower production estimates on adverse climatic conditions and the government’s sustained effort to boost India’s exports during the ongoing harvesting season. Adverse agro-climatic condition with a mix of sudden change and hot and cold weather followed by untimely rainfalls and hailstorms across the north-eastern states has resulted in massive crop damage this year. The weather suddenly turned hot during the peak mango flowering season of January and February, followed by immediate change to cold weather and then warm conditions again. The harvesting of early crop was preceded by a hailstorm in major growing regions, including the north-eastern states, resulting in huge crop damage. Thus, consumers who wait for a year to taste mango, the king of fruits, will have to pay more this year. Its price, however, fell to Rs 14 a kg by the second week of April before recovering again to trade on Tuesday at Rs 20 a kg. In the physical retail market, the Kesar variety is being quoted at Rs 100 a kg which stands at 30-40 per cent higher than last year. “Adverse agro-climatic condition has lowered mango crop size this year by 10-15 per cent. Sudden change in weather from cold to warm and vice versa during the peak flowering season, followed by hailstorms during early progress of fruits, damaged mango crop heavily. Thus, we expect mango price to remain elevated throughout this season,” said Ravi Vaghasiya, partner, Nilkanth Organic Mango Farm, a Gujarat-based exporter which primarily sends its mangoes to Canada and Switzerland. Based on early indication, however, the Union agriculture ministry in its First Advance Estimate released in January, had forecast India’s mango output to rise by 5 per cent to 20.7 million tonnes (mt) this season compared to 19.5 mt last year. “Based on lower output estimate, mango supply is set to remain scarce this year. 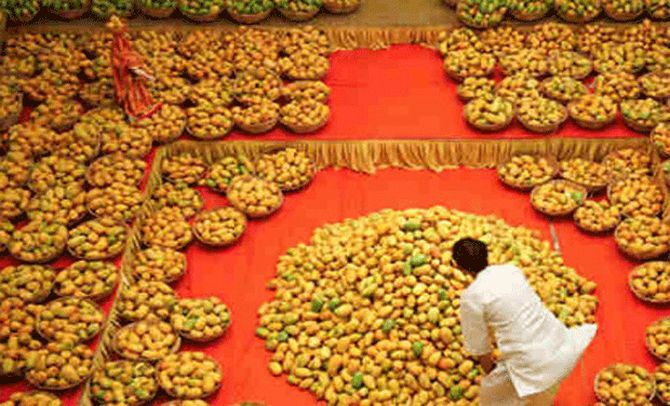 Thus, Indian exporters may find it difficult to meet growing export demand of certain varieties of mango,” said a senior official in charge of mango exports at one of India’s largest fruit exporters. However, D K Sharma, vice-president of All India Mango Growers’ Association, believed weather conditions in the next two months would be crucial for the growth and saleable quality of mango. Meanwhile, the Agricultural and Processed Food Products Export Development Authority (Apeda) has initiated a massive promotional programme to boost exports of mango this season. Apart from the traditional markets, Apeda has designated its dedicated officials to focus on increasing India’s market share in China, Kazakhstan, South Korea and Iran. Special attention is being given towards growth of mango exports to the US and European Union. India primarily exports Dusheri, Badami, Hapus, Safeda and Totapuri varieties, to name a few, to consumers of Indian and local origins. “Iran opened its market for mango import from India last year and we exported some quantity last year. Being a natural ally importing many commodities from India, we see huge potential for mango exports to Iran. "We plan to ship container-loads of mangoes through the sea route. We would take some of Pakistan’s share in the Iran market,” said a senior Apeda official. India enjoys a very thin presence in the global mango market. Data compiled by Apeda showed India’s total exports at 52,761 tonnes (worth $ 66.94 million) for the financial year 2016-17 compared to 36,779 tonnes ($50.04 million) in the previous year. Experts forecast an increase of at least 15 -20 per cent in mango exports this year. Know how to claim your PF money?